For a few years Tatiana Cohendy’s life has changed and has found a new location, Milan. Tatiana is french, from Lyons, her original plan was to stay in Italy just for the period of her studies, during which she started giving French lessons. One of her pupils, Domenico, changed her mind, becoming her life partner. Therefore, initial projects have become common to the couple and have been realized, for now, in an adorable couple of brothers: Noa and Elia. Two important changes in a short time: the choice of living in a foreign country and having started a family. 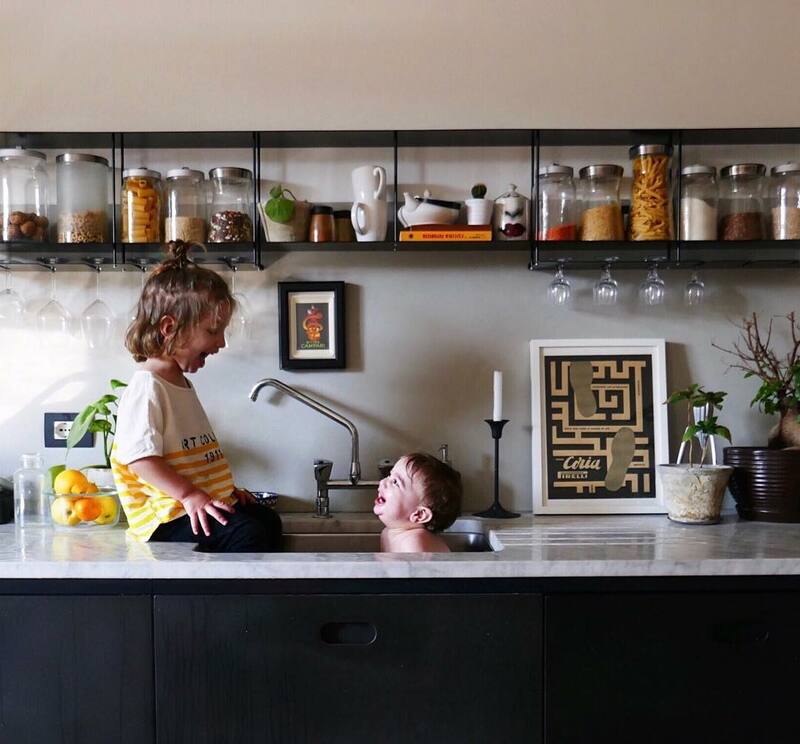 What allowed Tatiana to find a new space for personal expression was the photographic story of her new life with children shared on Instagram. An almost instinctive gesture, at the beginning, and then more and more organized: the use of the social network, indeed, allowed her to get in contact with other young mothers, close to her also phisically, and permitted her to find a new world of reference, sometimes useful for practical advices, sometimes important for social life. 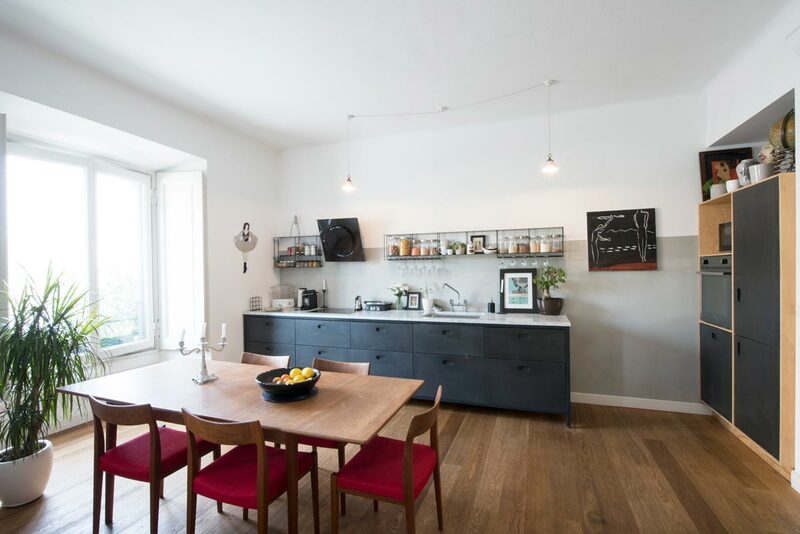 Three years ago Tatiana and Domenico decided to consolidate their roots in Milan and bought a house, to be completely restored: in fact they wanted to design it centimeter by centimeter, to make it the expression of their family. An architect friend helped them by transforming their ideas into drawings, sometimes more theoretical, sometimes very clear. For example they wanted an open-style kitchen directly connected to the living room, practical, functional, but not intrusive. 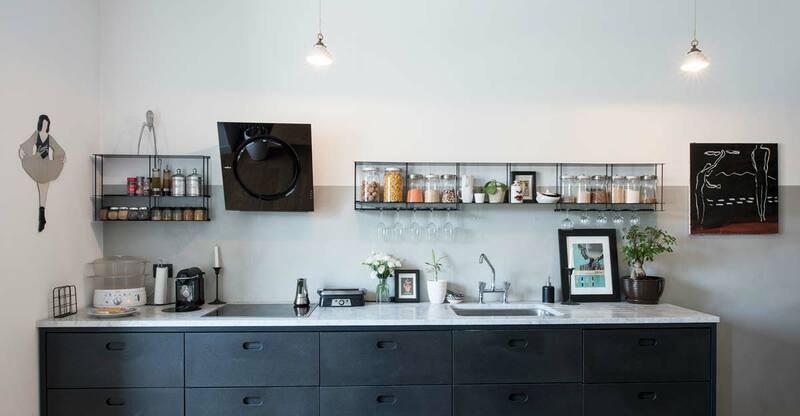 The solution was a black basic element in MDF Valchromat, provided with drawers in different sizes and with a Carrara marble top. On the wall Tatiana didn’t want real containers, not to weigh down the space, so, after some research, she identified in the Krossing bookshelf the answer to her need. The main feature of the structure, indeed, is the lightness: composed by shallow shelves (15 cm) and thin aluminum tubes, it tends to disappear if filled with objects. 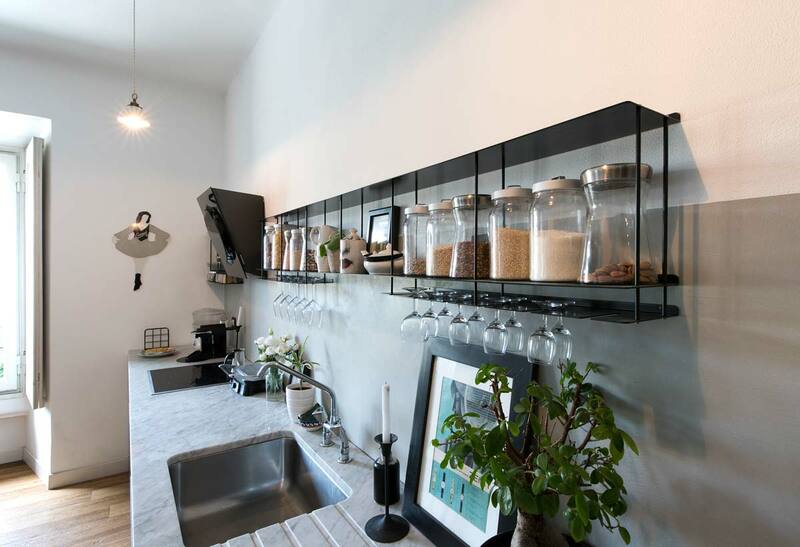 Therefore, at the sides of the kitchen hood, two Krossing compositions are developed, equipped with accessories such as the compartment suitable for the jars and the glass holder, all made of matt black painted aluminum.